The wind warning comes into force at 5am tomorrow, when gale force winds are expected in all areas. A STATUS ORANGE wind warning has been put in place across the four provinces ahead of the arrival of Storm Ali tonight. 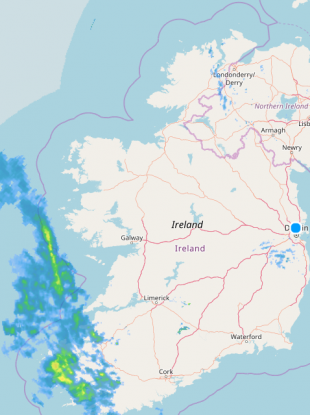 Persistent rain and strong winds are being predicted with Met Éireann saying that Storm Ali will track close to the west and northwest coast from the early hours of tomorrow morning until late afternoon. The Status Orange warning is on place for 17 counties in each part of the country, they are: all of Connacht, Cavan, Monaghan, Donegal, Dublin, Kildare, Longford, Louth, Offaly, Westmeath, Meath, Clare and Kerry. A Status Yellow wind warning is in place for the rest of the country with these conditions being previously predicted due to the movement of ex-Hurricane Helene across the Atlantic. Both warnings kick in from 5am tomorrow morning with Met Éireann predicting south to southwest winds with mean speeds between 65-80 km/h and gusts between 110-120 km/hr. Tomorrow morning will bring severe or possibly damaging gusts for a time in the morning, but rain will clear quickly to blustery showers in the afternoon. In the north-west, early morning rain will be heavy, and temperatures will reach a maximum of 15 degrees. The forecaster says that winds will be strongest along Atlantic coasts first before extending to eastern areas later tomorrow morning. Storm Ali is the first named storm of the 2018/2019 winter season. Email “Status Orange warning for 17 counties as Storm Ali to arrive overnight with gusts of 120 km/hr”. Feedback on “Status Orange warning for 17 counties as Storm Ali to arrive overnight with gusts of 120 km/hr”.